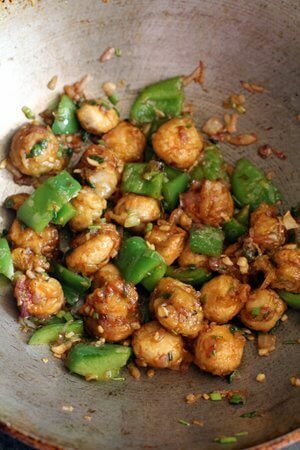 Mushroom manchurian is my favorite among mushroom starters Indian chinese style. Manchurian is India’s most loved Indo Chinese dish and no Indian chinese meal is ever complete without it, bet it a wet or dry manchurian. 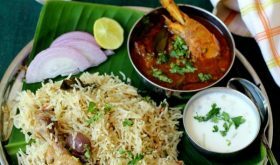 All over India, you will find majority of the Indian Chinese street food hawkers or restaurants boast of manchurian varieties like the ever popular gobi manchurian, vegetable manchurian, chicken manchurian, idli manchurian, baby corn manchurian and corn manchurian. 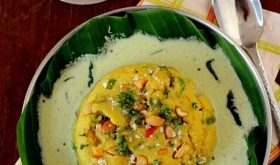 In Andhra too, you will find at least one Indian chinese street hawker in almost every street corner and they tend to make this fushion food spicer than normal since the telugu speaking people love to eat spicy food. 🙂 Infact, I have blogged a variety of manchurian recipes as we love to eat Indian chinese every other week. 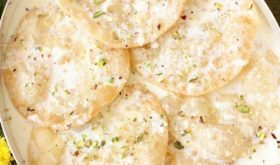 I have been receiving requests to post step by step food preparation for the Indian recipes that I publish in my food blog. I’m trying my best to post a few step by step pictures especially keeping beginner cooks in mind. 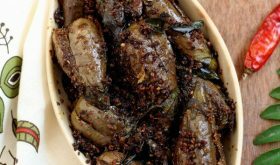 Mushroom machurian dry recipe is simple to make with minimal preparation and minimal ingredients. Its the deep frying that is slightly labour intensive but worth the effort keeping in mind the end result. The crust of the deep fried mushroom balls is crisp while the interior is soft on bite. 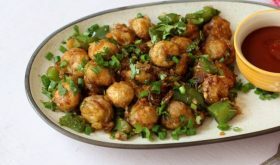 Recipe for mushroom manchurian dry is prepared on the same lines as other manchurian dishes. 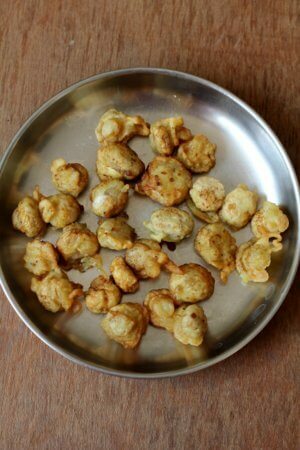 You can add green capsicum since it adds color, crunch and flavor. Ensure that you do not let the mushrooms sit in the batter for more than a few seconds as it tends to leave a lot of water. 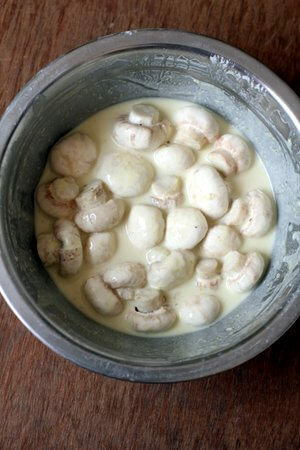 The batter has to be slightly thick so that it coats the mushrooms well before deep frying them in hot oil. The deep fried mushroom balls should not be allowed to sit too long once they are drained off the hot oil as they tend to become soggy. 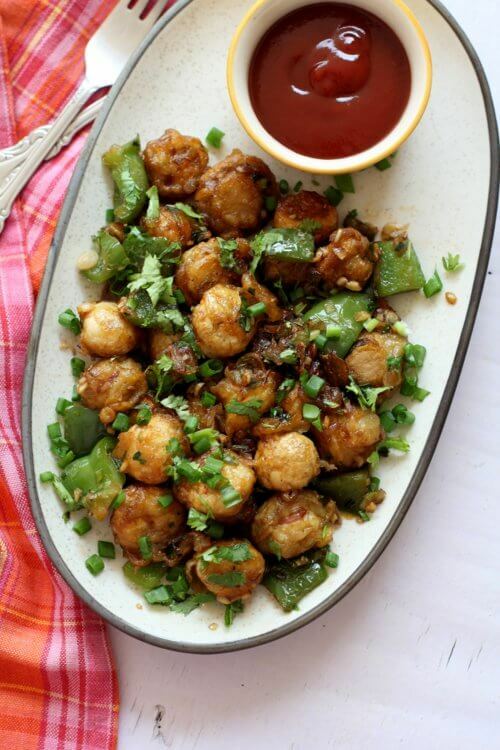 These deep fried mushroom balls are tossed in an exotic sauce that comprises of spring onion whites, sugar, soya sauce, green chili sauce and tomato sauce. It is the sauce which gives the manchurian all its exquisite robust flavor. 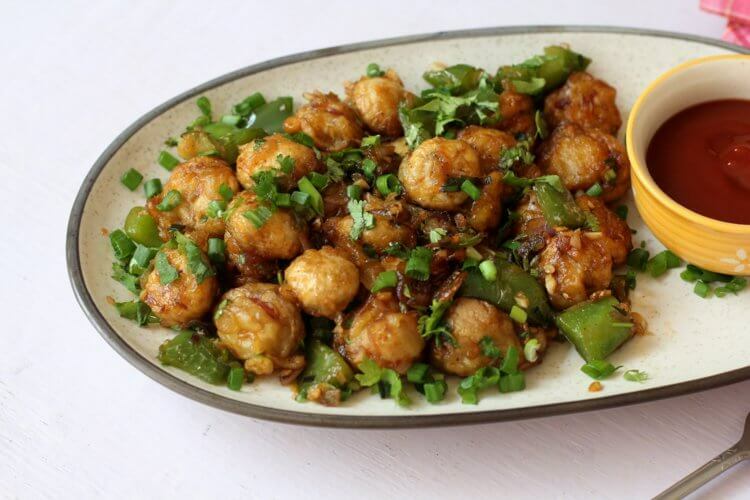 Finish off with a garnish of spring onion greens and fresh coriander and you have one of the best mushroom manchurian restaurant style on hand. Heat 1 1/2 tbsps of sesame oil in a large wok, once the oil turns hot, add the chopped garlic and stir fry for a few seconds. Add the green chillis and ginger and stir fry on high for a few more seconds. 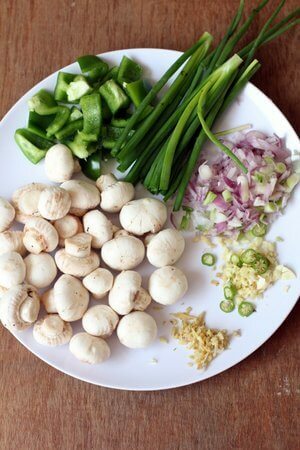 Add the whites of spring onions and stir fry on high for 2 mts, constantly tossing them. Add the sliced capsicum and stir fry for another 2-3 mts. They should retain their crunch. Reduce flame to medium heat, add the brown sugar, soy sauce, tomato ketchup, green chili sauce and vinegar. Mix well and cook for 2 mts. Add 2-3 tbsps of water and cook for a mt. Add the golden fried mushroom balls and combine. Toss on high flame for a mt and turn off heat. Garnish with the chopped spring onion greens and coriander leaves. You can use any variety of mushrooms. I have used button mushrooms. Large sized mushrooms can be cut into thick long pieces. Tried it. Came out very tasty! Thanks for sharing the recipe! 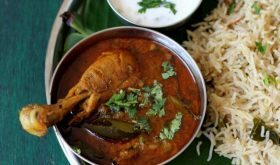 One can try tender jackfruit instead of mushroom. Tastes pretty good.